Get a $5 discount off your first order at SwansonVitamins.com, plus get a $10 credit for referring new customers to Swanson Health Products. Just register through this Swanson Health Products $5 Referral Link to get $5 off for new customers on SwansonVitamins.com. You will get a free $5 coupon when you register for your new account. This offer is for new customers only who have never shopped at SwansonVitamins.com. Once you register, the $5 coupon will appear in the My Coupons section of your account. 1. Share referrals with your friends via social media or by using your own unique referral link. 2. Your referrals will get a free $5 coupon when they register for a new account. 3. After your referrals make their first purchase of $20 or more, you will get a $10 Reward Coupon. 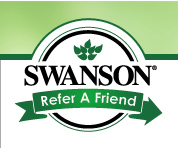 In order to participate in the referral program and refer new customers, you must be a currently registered customer who has ordered from Swanson Health Products within the last 6 months. The referral program is for U.S. residents only. You cannot refer yourself or members of your household. You may refer a maximum of 24 people during a 12-month period for a total of $240 in referral coupons, which can be redeemed toward future purchases. Swanson Health Products employees or any members of its affiliates, subsidiaries, or promotional agencies, including immediate family or household members, are not eligible to participate in the referral program. Just visit www.swansonvitamins.com/referral to register and start referring your friends. In order to qualify for the $10 referral reward, your referrals must complete the registration process and make the minimum $20 purchase with Swanson Health Products. Your referrals must not have previously registered with Swanson Health Products under any email address or alias within 24 months. New Swanson Health Products customers can also register for their newsletters to receive a 10% promotional code and free shipping on orders of $50 or more. You may redeem up to 3 coupons at 1 time (i.e., on any single order), and they may be combined with 1 current, active Promo Code. That means you can combine your $5 new member coupon for signing up through a current customer’s referral with the 10% promo code that you get after registering for their newsletters. If you’re looking for discounts on vitamins, then check out the Vitacost Rewards Program as well to get $10 off your first purchase of brand-name vitamins and more.